Mother’s Day is approaching again. Our mother’s are precious to us and we always love to give something from the heart. What could be more from the heart than something handmade? Since it is usually mom herself that is the craft creator, we thought we would give a helping hand to the dad’s out there. 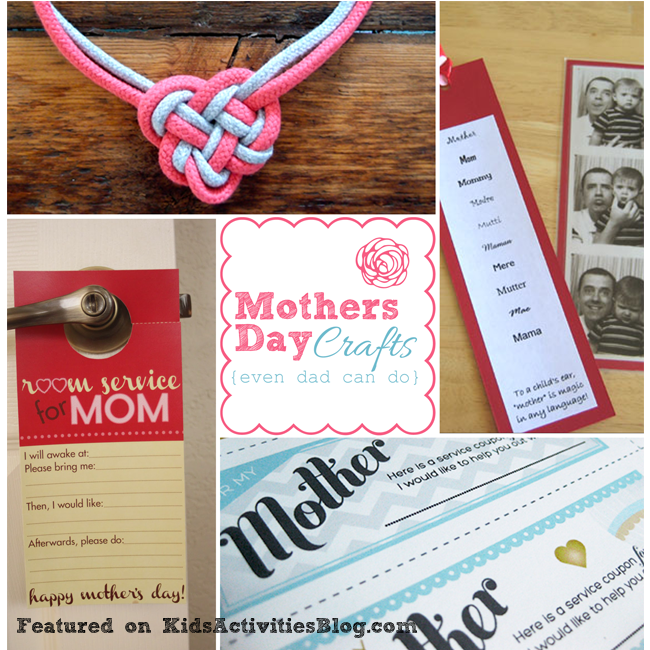 Here are some simple mother’s day crafts we found linked up around the web and in our It’s Playtime! meme. 1. If your mom enjoys reading, a mother’s day book mark will come in handy and keep her smiling from Make and Takes. 2. Mom’s always like help around the house. Print these service coupons and fill in the chore you will help her with from Abrosia Creative. 3. All mom’s love a gift from the heart. Write down special wishes for mom and put them in a jar as a keepsake from Busy Bee Kids Crafts. 4. You can never go wrong with breakfast in bed. Just print this free room service sign and let mom make her morning selections from Whatever Dee Dee Wants. 5. Easily make your mom a new summer necklace with a few simple knots and some colorful shoestring from Clones n Clowns. 6. Make mom a sweet note telling her just how much you love her with cardstock, construction paper and glue from Brillian Beginnings Preschool. 7. Decorate an empty fruit can to give mom her favorite candy in a very creative and fun way from Our Best Bites. 8. Here is a simple way to create a card telling mom all the reasons why she is so special to you from Wayward Girls’ Crafts. I love this list of 8 easy Mothers Day ideas!